Widebody coupe being readied for SEMA 2014. 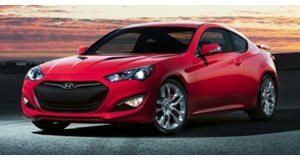 Hyundai will present this wild Genesis Coupe concept at SEMA 2014 next month, as it looks to send the soon-to-be-discontinued four-cylinder model off with a bang. Developed with Chicago’s Blood Type Racing, the coupe’s 2.0-liter four-pot has been upgraded to almost 1,000 horsepower thanks to increased bore, a bigger turbo, remapped ECU, nitrous kit, new exhaust and intakes, and a glut of cooling mods. All that colossal power will be sent to the rear wheels via a six-speed manual short throw shifter, while the chassis has been beefed up with a coilover suspension, strut tower braces and Wilwood brakes. As you can see, a suitably aggressive makeover has also been applied to the Candy Red Genesis, including a widebody kit by Kei Miura that increases girth by 60 mm, a rear wing and 19-inch alloys. Inside, BTR has added Sabelt racing seats, harnesses, a Cusco roll cage and new gauges. The BTR Genesis will be joined by a 550-hp Genesis by ARK Performance in Las Vegas, along with other extreme one-offs.